When I was in Croatia, I was never really very hungry, but I ate anyway. I don’t know if it was the heat, or the light walking or a combination thereof, but I wasn’t really ever hungry. Until we got to Dubrovnik and I hiked around the walls with my parents. Then I was ravenous. See all those walls? I hiked around them all. For real. And yes, you heard me right, I went traveling with my parents. In my mid-twenties, I voluntarily traveled with my parents. I’ve been doing it for at least ten years, so why change a good thing? (Mind you, by the tail end of it most travels I’m not the happiest camper, but I always enjoy spending time with family). We went to three cities: Split, Makarska and Dubrovnik. I enjoyed them all, but for different reasons. Split might have been my favorite for it’s mix of history and food and just pretty-ness. 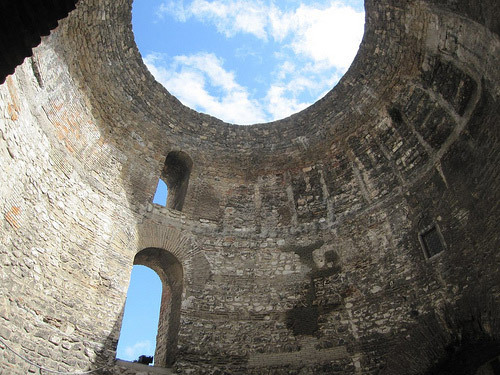 The old town of Split is actually Diocletian’s Palace. And if you don’t know Diocletian, look him up – he was one of the last emperors of the Roman Empire. For good measure, let’s throw in another “empire”. Empire! While in Split we ate, wandered the Riva and the city, had a walking tour and ate some more. The place that we ate that stood out the most to me was a place called Figa. My dad had shelled prawns that looked delicious (but seemed like too much work for me to try to eat), my mother had monkfish and I had sea bass. Oh man. It was all great. The fish was light and yet still flavorful and the service was charming even though it was slow. The restaurant (like much of the old town) had white stone walls and unlike a lot of Split (or at least the Split that I saw) was decorated in kind of an industrial chic with a very European flair. Bare lightbulbs in rubber tubing chandeliers and a DJ mixing table sat casually next to a computer in the dining room – wasn’t really sure what that was about, maybe they hosted raves on the weekends? Long story short, go to Figa if you have the chance – fair warning, though – they only accepted cash. Our bill for three with alcohol ran us about 400 kuna. And unfortunately while Croatia is entering the EU July 1, 2013, because of everything that has been going on with Greece the EU is requiring a stable economy before countries can take on the euro as the official currency. Croatia isn’t expecting the euro until 2020. 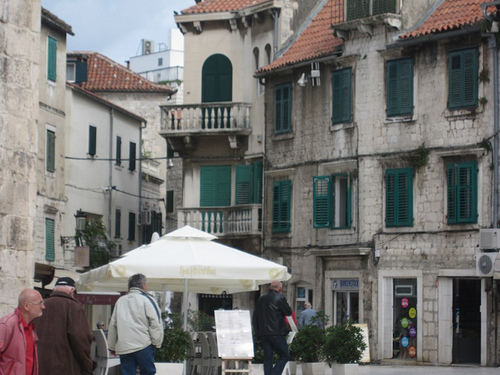 I will tell more about Makarska, the tornado and Dubrovnik (and how I got all nerdy for Game of Thrones) later. Need to get used to this writing thing again!